Unfortunately, with stagnant or lower wages, consumers find that goods from the increasingly inefficiently sectors are increasingly unaffordable, especially if prices rise to cover the resource requirements of these inefficient sectors. For most periods in the past, commodities prices have stayed close to the cost of production (at least for the “marginal producer”). What we seem to be seeing recently is a drop in price to what consumers can afford for some of these increasingly unaffordable sectors. Unless this situation can be turned around quickly, the whole system risks collapse. I have described the problem behind rising costs as increasing inefficiency of production. The technical name for our problem is diminishing returns. This situation occurs when increased investment offers ever-smaller returns. Diminishing returns tends to occur to some extent whenever resources of any kind are extracted from the ground. If the extent of diminishing returns is small enough, total costs can be kept flat with technological advances. Our problem now is that diminishing returns have grown to such an extent that technological advances are no longer keeping pace. As a result, the cost of producing many types of goods and services is growing faster than wages. Metals and Other Minerals. In the same manner as oil, we extract the easiest (and cheapest) to extract minerals first. These minerals include metals and other substances such as uranium, lithium, and rare earth minerals. Part of the problem is that ores of lower concentration must be used, leading to a need to move larger amounts of extraneous material that later must be disposed of. These ores may be found deeper in the ground or in more remote locations, adding to extraction costs. Furthermore, oil is generally used in the extraction of these minerals. As the cost of oil cost rises, this adds to the cost of mineral extraction, making minerals increasingly unaffordable. Google is a case study of why we need antitrust enforcement. With Google at 97% market share in search [correction: 67%], Yahoo and Bing don’t have enough of a foothold for it to be worth the gamble of trying to beat Google at search, even with Google having degraded its service so badly that there are now obvious ways that a challenger could best them. I had assumed that the ongoing crapification of Google was for a commercial purpose, namely to optimize the browser for shopping and the hell with everything else. But as we will discuss in more detail below, my experience in poking around to see about buying a new laptop demonstrates that Google has gotten worse at that too. Lambert, who I enlisted to confirm my experience, was appalled and said, “What have they been doing with all that money?” But as we’ll see, there is an evil purpose here, just not the evil purpose we’d first assumed. It isn’t as if the degradation of Google is a new phenomenon. I used Google heavily while researching ECONNED, which was written on an insanely tight time schedule. It worked really well then. But even a mere year later, by late 2010, the search algo had been restructured in some mysterious way to make the results much less targeted, and it’s been downhill since then. The most recent appalling change came in the last few months: eliminating the ability to do date range searches. But all of this ruination was so Google could make more money by optimizing for shopping right? Apparently not. I’ve idly and actively looked for stuff on the Internet over the years. A reliable way to do that was to type in a rough or better yet precise description of the product/product name plus the word “price”. That would usually get you a nice list of vendors selling what you wanted so you could comparison shop, and often you’d get links to sites like Nextag which would provide a list of vendors with all-in prices as well as vendro ratings. Over the last two months, I’ve been looking for an easy-to-install monochrome laser printer (I have NO time to deal with anything more demanding than plug and play, and sadly, dealing with printers on a Mac is not plug and play). I didn’t get any good answers from all my searching and would up buying a used version of my current out-of-production printer. In retrospect, it appears some of my search hassles may have been due to Google, not to having atypical requirements. I want a Macbook Air with a 13 inch screen (I attach an external monitor at home, but on the road, as now, I can get by with just the existing real estate) and 8GB of RAM. All I need is the newest version and the most RAM I can get, since you can’t upgrade the RAM in these solid-state Macs. Note that the 8GB is not the standard configuration, but some stores carry it in stock. Why is this so terrible? First, none of the five sponsored links takes you to an 8GB Macbook Air. The Amazon link doesn’t either. The Apple one takes you to a landing page for Macbook Airs (the Apple site is an abortion, too much making you read the sales hype and too many clicks to actually make a purchase if you are so inclined). The Macmall link is the only good link on the mess of links. It takes you to a page of MacBook Airs with enough specs listed with each that you can see what one with 8GB of RAM costs. The eBay link was close to useless, in that I’m not interested in a used machine (if I were, I would have gone to eBay directly and yes, the overwhelming majority are used). But even worse, if you click through, it is again not limited to 8GB machines and the results are almost entirely off spec. But you can see how this defeats comparison shopping, which is one of the alleged big bennies of the Web, if you have to click through a whole bunch of irrelevant links to get to a quote or two. And my version was in some ways worse than Lambert’s. I played with some variants (as in putting terms in quotes, including the screen size). The patterns were that I’d either get a first page with looked like product listings, with at most two of ten links, and none of the sponsored links taking me to what I was looking for. The other results would be heavy on reviews when I was not looking for reviews (and I would not typically get reviews on a “price” search). Now we do have Apple as the first Google-like search result and sponsored link as before but in this case, you go straight to a landing page with what you want to see. But the Apple links being better in this case has everything to do with Apple quirks, so we’ll put that aside. Of the rest of the first page standard search listings, the ONLY other one that takes you to a page where you can buy the product is the Amazon listing, #4 on the page. All the rest are product reviews. What can we infer? Unless you are Amazon or the manufacturer, if you are a retailer and want to show up on the first page of a Google search, you have to pay for an ad. Otherwise. Google appears to be making sure you won’t get there for free. Yet Google isn’t making much if any effort to make sure those sponsored ads are all that relevant to you as shopper. 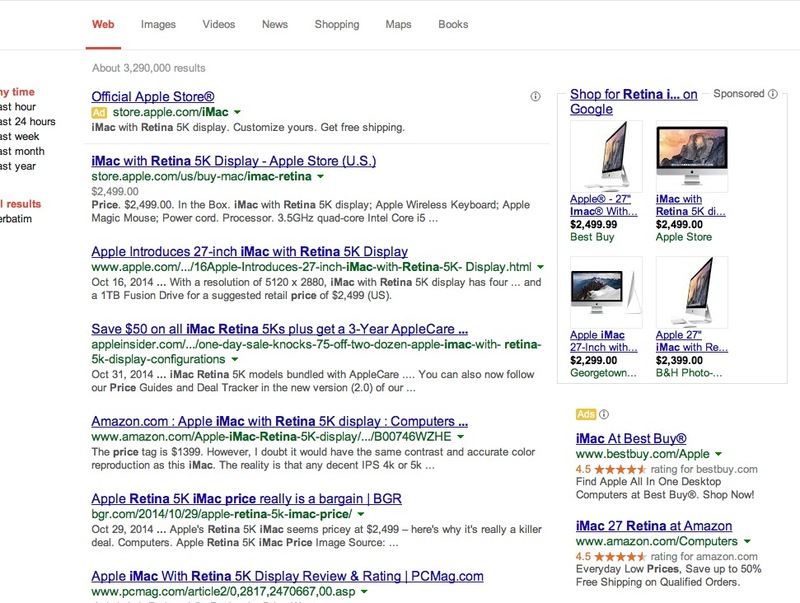 Now if it is a unique product, like the Retina iMac, the sponsored ads are more likely to be a match with the search target. But even so, several are links to irrelevant models, such as the BestBuy, WalMart, and Stuccu ads. 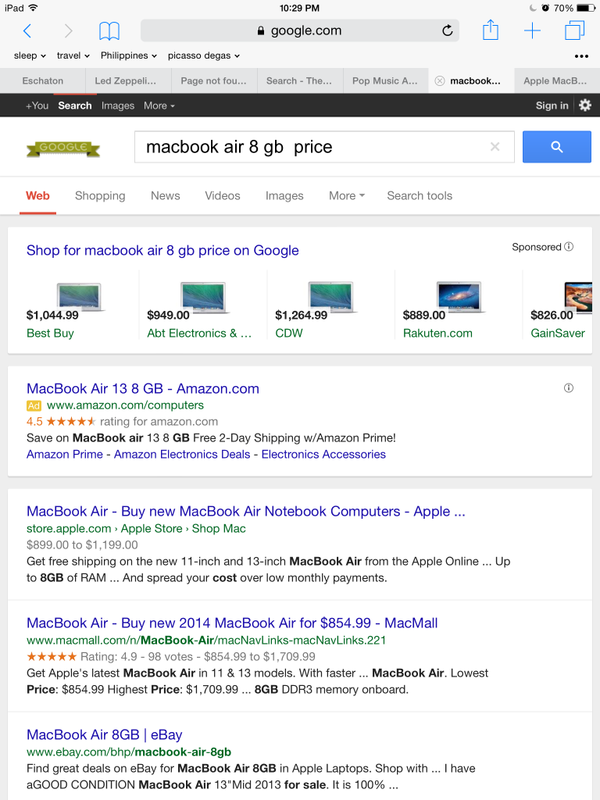 So Google is indeed being optimized…..for its own advertising. The message to all but the very biggest vendors is that you must pay to show up. No more getting in the back door by being picked up by an price listing service that gets on Google’s first page, or by matching the search terms well. But as a user, it looks like Google is cooking its own goose. These crappy results makes me much more inclined to go to Amazon and look at Amazon merchants, and compare price at 3 or 4 Apple vendors I know are reliable with returns in case I get a bum machine. The fact that I’m not getting remotely usable results from Google searches and that means I’ll skip them. How long will it take for advertisers to realize that they are effectively being scammed by Google, that they are often paying for bad clickthroughs because Google is putting them on search results where they don’t belong but the retailer has written successful clickbait ads so they get bad visits? My impression is that Google Adsense reporting is opaque enough that they might not recognized Google’s culpability (indeed, I can see Google optimizing its algos to keep the bad clickthroughs at the highest level that an advertiser would tolerate). And in the meantime, all we have as customers to look forward to is the Godzilla versus Mothra battle of Amazon versus Google in shopping search. It’s enough to make one think nostalgically about malls. And I was never a fan of them either. Update: Some readers say that they can access date range searches through “Search Tools. One provided a link as to how it displays. It sits on the far right of the list of options that starts with “Web Images Videos” etc. * Just so you know, I hate buying new computers. I hate all the time the setup takes, I hate that some things never work the same, I hate having to find and download drivers. My pattern is to use machines until they die or become so hopelessly memory constrained that I am forced to abandon them. I used my NeXT for 10 and a half years and my TiBook for over eight. The idea of giving up a working machine after four years and a few months offends the Yankee in me, aside from the large tax on my time of getting a new machine broken in. ** Time Machine does dutifully chug with great frequency and slows down my machine in the process, so it appears to be doing something. I’m just not convinced that it is the right something. But as he is a person with bad manners and a disagreeable personality, many have conflated Scrooge’s personality traits with his business practices, although the two are unrelated phenomena. As a miser and businessman, Scrooge provides numerous valuable services to the community including, as Walter Block has shown, driving down prices and making liquidity available to those who, unlike the wrongly maligned misers, have been either unwilling or unable to save in comparable amounts. His business prowess notwithstanding, however, a closer look at Scrooge’s economics suggests some significant blind spots in several areas. Scrooge, as displayed in many of his comments and observations, misunderstands some key economics concepts. Indeed, Scrooge’s ignorance in these areas may contribute to his bad habit of assuming that others are taking advantage of him, or are too foolish or lazy to attain what Scrooge has. As Carl Menger demonstrated long ago, value is subjective and different persons value goods differently depending on the person’s goals in life. Does the person want to raise a family? Perhaps he wishes to be an independent scholar who devotes all his time to reading and research. Perhaps he wishes to be a hermit who prays most of the day. Money prices reflect these goals, and a hermit will value a video game console differently from a gamer. But of course not everything can be calculated in terms of money prices. A like or dislike of Christmas, for example, cannot be calculated this way. So here we see the real root of Scrooge’s fondness of money. In Human Action, Ludwig von Mises explained that human action stems from a desire to “remove unease” about one’s present situation. With Scrooge we see (if his fiancée is to be believed) that the thought of being destitute is a source of constant unease for him. Thus, he desires to build as much wealth as possible in the hope of being beyond the possibility of poverty. As Scrooge’s primary goals is poverty avoidance, this colors how he views all economic action. His peers tend to not recognize this in him, either dismissing his as simply “odious,” as Mrs. Cratchit does, or as unhappy. In fact, as Levin demonstrates, Scrooge appears rather content with his situation at this point, although, unfortunately — just as Scrooge’s colleagues and family members do not appreciate his ranking of values — Scrooge does not seem to appreciate that others might value money for different reasons. This is demonstrated in an early exchange with Scrooge’s nephew. When wished a merry Christmas by his nephew Fred, Scrooge retorts "What right have you to be merry? What reason have you to be merry? You're poor enough." To this Fred replies, "What right have you to be dismal? What reason have you to be morose? You're rich enough." Fred is probably wrong about Scrooge being morose, and he also appears to not understand why Scrooge values money. But at the same time, Scrooge also displays an ignorance of value subjectivity by suggesting that Fred’s ability to be merry is rendered impossible by his poverty. In this same exchange, although Fred doesn’t understand how Scrooge could be happy, it is Fred who displays a better understanding of economic value when, in response to Scrooge’s declaration of Fred’s poverty, Fred declares “There are many things from which I might have derived good by which I have not profited.” By this, Fred means that he profits from many things which bring him no money profits. It is often supposed by both critics and defenders of Scrooge (and by Scrooge himself) that he is a more skilled businessman than most, and that he is more savvy, more intelligent, and more prudent in his management of his own affairs. Other people, Scrooge supposes, are more likely to be incautious and trust to fate for good fortune. But there is ample evidence that the lack of material wealth enjoyed by others is not due to any lack of intelligence or prudence, but simply that they value things differently from Scrooge. Scrooge’s ex-fiancée, for example, is no fool when it comes to money. In her final conversation with Scrooge, she notes that when she and Scrooge had agreed to marry, it was assumed that they would be poor in the beginning, but that “we could improve our worldly fortune by our patient industry.” In this, she is expressing what most young heads of household know — that in most circumstances, households build wealth slowly, since raising a family is costly. Her words hardly suggest a woman who plans to throw caution to the wind. Scrooge is quick to assume that others are imprudent for marrying (he is dismayed by his nephew’s decision to marry for love) or doing other activities they find to be pleasurable when those same energies could be devoted to making money. But Scrooge is simply imposing his value systems on others, although in this, he is no more guilty than Dickens, Fred, and all the others who insist that Scrooge absolutely must celebrate Christmas. Bob Cratchit: Victim or Wily Negotiator? In addition to lacking insight on the subjective nature of value, Scrooge also fails to understand the intricacies of voluntary exchange. Much is made by Dickens of how Cratchit is the hapless victim of Scrooge’s miserliness, and in response, the contrarians note that if Cratchit were indeed underpaid, as Dickens implies, then Cratchit is free to find employment elsewhere. This is no doubt true, all things being equal, but we also find that Scrooge himself, well before his change of heart at the end of the story, is open to re-negotiating the terms of Cratchit’s employment. Scrooge denies his openness to renegotiation in words, but shows it with his actions. When Cratchit asks for a vacation day on Christmas day, Scrooge claims that this is akin to “picking a man’s pocket,” but ultimately, Cratchit negotiates for himself the day off, with nothing more than a tepid “be here all the earlier next morning,” from Scrooge. Scrooge was not compelled to give Cratchit the day off, so given Scrooge’s clearly demonstrated immunity to social pressures, it stands to reason that Scrooge concluded it was more profitable to give Cratchit the day off than face the possibility of losing Cratchit as his clerk. But even if he were susceptible to being shamed into giving the day off, he is nonetheless voluntarily doing so. At this point, Scrooge shows that his claim of having his pocket picked is sheer nonsense since we plainly see that his demonstrated preference was to grant the day off. Scrooge cannot now claim that he was somehow robbed. If he felt he was being robbed, he could have denied Cratchit the day off. It turns out, however, that Cratchit, while not “underpaid,” is at least seen as a bargain employee by Scrooge, and so much so that Scrooge felt he could afford to voluntarily pay Cratchit a small raise in the form of a day off. Ebenezer Scrooge asks very little of his fellow human beings. He only asks that they keep up their ends of the bargains in the business agreements they make. It was just his misfortune, then, that he is surrounded by a bevy of control freaks who are hell bent on making sure Scrooge enjoys Christmas in just the way they want him to. Scrooge returns the favor by maintaining a ferociously low opinion of most others around him, concluding quite often that others are simply fools for choosing to enjoy the company of friends and family when there’s money to be made. Ultimately, though, it’s all just an unfortunate misunderstanding, and one that might be improved by a reading of Man, Economy, and State. For years, we've been warning here at PeakProsperity.com that the economics of the US 'shale revolution' were suspect. Namely, that they've only been made possible by the new era of 'expensive' oil (an average oil price of between $80-$100 per barrel). We've argued that many players in the shale industry simply wouldn't be able to operate profitably at lower prices. Well, with oil prices now suddenly sub-$60 per barrel, we're about to find out. 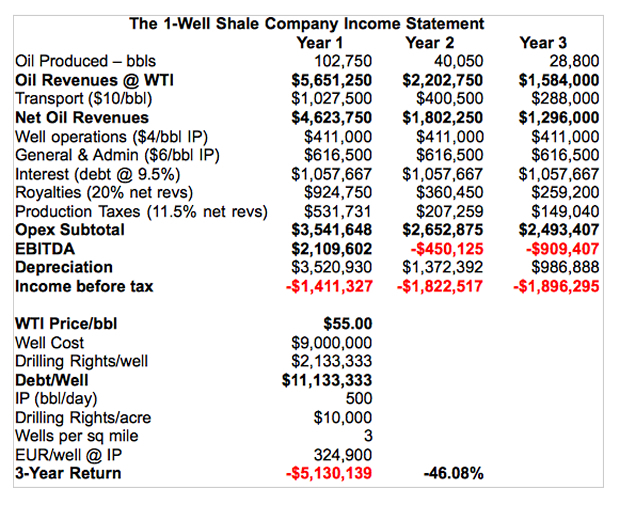 Using the traditional corporate income statement, it is difficult to determine if shale drilling companies make money. There are a lot of moving parts, some deliberate obfuscation at some companies, and the massive decline rates make analysis difficult – since so much of reported profitability depends on assumptions made regarding depreciation and depletion. So, can shale oil be profitable? If so, at what price? And under what conditions? I try to deconstruct all this here. A shale well consists of a vertical shaft that drives down into the earth to get to the right geological layer where the oil is located. Then the shaft bends 90 degrees, and extends horizontally 5000-10000 feet. It is in the horizontal section where the magic takes place. At intervals along the horizontal section, the “frac stages” happen, each of which fracture the surrounding rock to release the oil locked inside the rock. Constructing a shale well happens in two stages. First both the vertical and horizontal sections of the well are drilled, and that costs around $4 million taking perhaps 20 days. Then, the well is “completed” - this is where the frac stages are placed. Each frac stage costs around $70k, and there are often 20-30 frac stages per well. The entire completion process costs around $4M. Once completed, the well starts producing oil and gas. The initial production (IP) of a new well is a critical number for estimating the total amount of oil likely to be produced over the lifetime of the well (“Estimated Ultimate Recovery” = EUR), along with the expected decline rate. While the EUR is a theoretical number and assumes a recovery time of 10-30 years, from a practical standpoint, companies need to recoup the costs of drilling the well within 3 years. Shale drilling has dramatically improved over the past five years. Horizontal lengths have doubled, upgraded drill rigs result in fewer breakdowns and faster drilling speeds, pad drilling has eliminated the downtime required to move the drill. Today's wells (vs wells drilled in 2008-2011) have horizontal sections twice as long, with three times more frac stages, with closer frac groupings, and the wells are drilled in about half the time. This results in wells that produce about twice as much, and take half the time to drill. However at the same time, many of the best spots have already been drilled, so the significant improvements in drilling efficiency have only been able to increase per-well production by a modest amount – perhaps 7%. There are three primary geographical regions where shale oil drilling takes place: Bakken, Eagle Ford, and the Permian Basin. 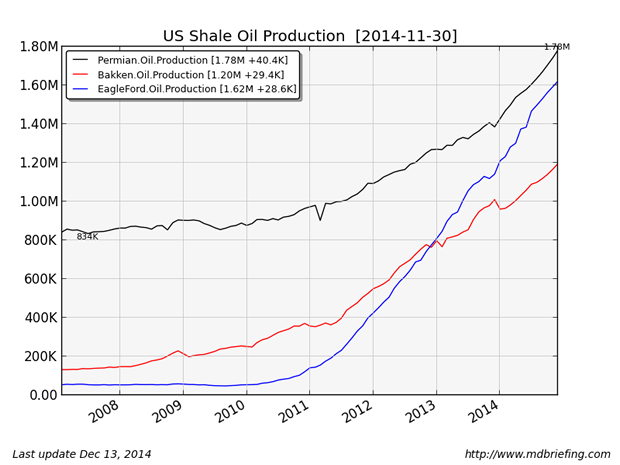 Total production in these three areas: 4.6 mbpd, or 92% of shale-region oil production in the US. Shale regions provide all the growth in US domestic oil production. Of these three areas, Bakken and Eagle Ford are the most productive oil shale areas, and of these two regions, I've selected the Bakken for a more detailed analysis. 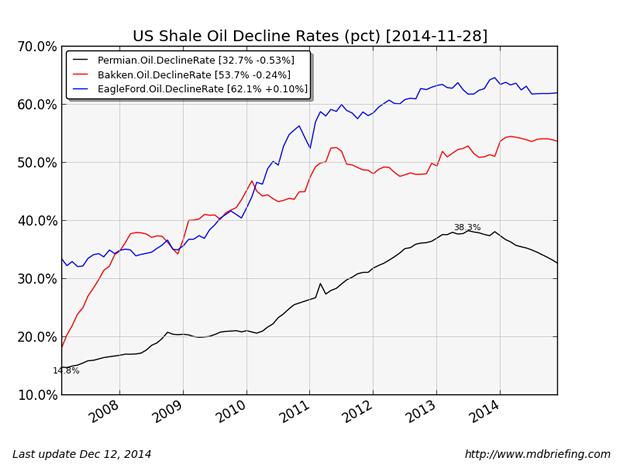 The decline rate of shale is the defining characteristic of a shale well, and a shale region. Decline rates vary by region. On average, the Eagle Ford region has a 62% decline rate, the Bakken region overall has a 54% rate, and the Permian region (many wells there are not horizontal wells) declines at a 33% rate. Individual wells decline more rapidly, and most steeply in their first year of production: Bakken wells decline at a 72% rate for the first year, and then more slowly in the following years. Many Permian wells are vertical wells, and so their decline rates are much more gradual, accounting for the slower Permian region decline rate. In order to acquire the right to drill on a particular patch of land, the drilling company must purchase these rights from the landowner, and/or another drilling company that has already bought the rights. In the most productive areas such as the Bakken shale, rights are expensive, with recent transactions priced around $10k per acre. After a fair amount of experimentation, drillers have determined they can put from 1-3 wells on one square mile before the wells start interfering with each other. There are 640 acres per square mile, therefore drilling rights are about $6.4M/square mile. This makes land costs to be around $2M-$6M per well. Before you can drill, you have to get the rights. Typically, you go into debt in order to buy the rights, then you start drilling to recoup your investment and pay the interest costs on all that debt. Maybe you can even sell those rights to someone else for a profit. That's the ponzi aspect of shale: buying land rights with junk bond financing for $2000/acre, and selling those right off to an unsuspecting oil major for $10,000/acre. Rights only last from 5-10 years. Failure to drill = wasted money. To understand the economics of shale, we view company performance through the lens of accounting. A good accountant is a historian, honestly assessing the success or failure of a particular venture. (A bad accountant – at Enron, for example – is a fiction writer). Revenues: barrels of oil sold x the price of oil. Its pretty simple. Capex: capital expenditures. In shale, this is all the costs involved in drilling and completing wells, purchasing equipment, land drilling rights, and other long-lived assets required to run the business. depreciation/depletion: a fraction of capex – it should be the decline rate of each well multiplied by the cost of the land plus the cost to drill & complete. here is where the funny stuff happens. If you want your company to look profitable, you will tell your accountant to write a work of fiction rather than be a historian. Instead of having her use your actual 72% well decline rate, you will instead tell her to use, say, 10%. This is the number I use to study profitability in the shale world. I can then apply my own depreciation based on decline rates and figure out for myself how the business is really doing. All right, armed with your new degree in shale accounting, let's look at a simple fictional example. 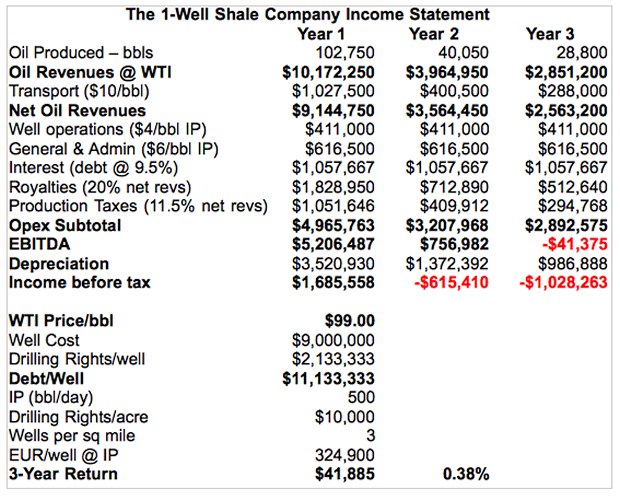 The hypothetical One-Well Shale Company obtains property for $10k/acre, then drills and completes a Bakken shale well costing $9M, with an IP of 500 bbl/day, 1st year production: 102k bbl, decline rate 72%. Further, we assume an eventual 3 wells per square mile, and an oil price of $99/bbl. The income statement shows that with honest accounting, we are barely profitable just looking at the 3-year P&L statement. The price I selected wasn't an accident – I searched for the break-even price and found it at around $99/bbl. However, will this well at $99/bbl ever make back its drilling costs? It won't, since in the following years, the “fixed costs” for the company will be a heavier and heavier burden on the well whose production declines every year. Likely, $99/bbl is even too low. We can call it a “best case scenario” - only if we assume One Well Shale sells the well to someone else for $986k (the remaining depreciation) at the end of year 3. What's more, companies have already spent huge sums accumulating land, on which they've drilled a relatively smaller number of wells, so this “One-Well” shale company is definitely fictional. Take OAS, which has 468 wells in production (45k bbl/day = 98 bbl/well) and 779 square miles of land they've bought for $1.8 billion. That's only 0.6 wells per square mile. However, they've already spent the money for the land, so from a “cash flow basis”, they don't really count the land cost when answering the question: “do I want to drill a well here or not.” At this point, money to buy the land is gone, so from a corporate survival standpoint, all they ask is, “if I drop a well, will it pay me back in 3 years?” And in the current environment, they probably only look at year 1 when making this analysis. But from an overall economic analysis of shale profitability over the longer term, land cost really is an important factor, so we include it in our accounting. If we were to be hard-nosed, we would probably assume a “wells per sq mile” of 0.6, since that's the “actual debt burden” on the real drillers like OAS. Now lets drop the oil price to $55/bbl and see what happens to One-Well Shale. Its a sea of red ink. Clearly this well loses money. It cost $9M to drill, and we get back $2M in EBITDA at the end of year 1, the best year for the well. By the end of year 3, EBITDA is negative. It is definitely not worthwhile to drill this well, not even if we assume the land is free. Shale producers don't want to expose themselves to bouncing oil prices – they have fixed costs, and so they'd prefer to have fixed revenues too. So they typically engage in oil price hedging to eliminate one big variable from their business plan. One-Well Shale certainly had big problems when oil dropped to $55/bbl; if One-Well had engaged in hedging, it might have been able to ride out the low prices at least for a time. There are many types of hedges available – our friendly banking establishment stands ready to provide all sorts of financial tools to shale companies to help them out. For a fee, of course. I'll start with the simple ones, and gradually get more complicated. Swaps: buyer locks in a fixed price for oil. No upside, complete downside protection – you know exactly what price you'll get, and on what date. Low cost. This is why futures markets exist. Speculators take the risk, and companies get to operate in a more predictable world. Puts: complete downside protection, unlimited upside. The higher the floor and the longer the date, the higher the cost. Puts are relatively expensive. Collars: complete downside protection, lower cost, limited upside. Buyer writes a call, and buys a put. Upside available up to the call strike price, and the call helps make the put less expensive. As with the standard put, the higher the put's strike price and the farther out the date, the more expensive it is. 3-Way Collars: limited downside protection, limited upside, usually free cost. Buyer writes a call and a put, and buys another put. This complicated beast generally ends up being free, but only is good for maybe $10-$15 of coverage. It's probably a banker's delight. It sounds vaguely salacious. When you look at the company hedge book, which they report in their 10-Q, understanding just what sort of coverage they have is quite important. Swaps provide perfect coverage, while 3-way collars only protect against a fraction of the drop we've just experienced. And its important to match up the number of barrels of coverage to the oil production, to see the percentage of coverage the company has in place. A survey of shale companies shows a range of from 20-60% coverage, at an oil price of about 90. Looking at our favorite Bakken company OAS, we see their hedge book below, helpfully provided in their investor document. It looks complicated. So we just look for key words: first, what type of hedges? Swaps, puts, & 2-way collars. Great, that's 100% coverage. Second, how much production do they represent? 1H 2015: 32k bbl day, and 2H 2015: 15k bbl/day. Let's assume OAS keeps production steady at 45k bbl/day. That's a 71% coverage for 1H 2015, and a 33% coverage for 2H 2015 at “around” $90/bbl. Looks like they'll be mostly ok for 1H 2015, but for 2H 2015 they will definitely be losing money if oil stays at $55/bbl. Hedges can be cashed in at any time. A company with a trader as a CEO, or one that needs to raise cash to stay in business today might well decide to “go naked” and take their chances with market oil prices and close out their positions. One company did this just recently. CLR sold their entire hedge book in Q3 2014, raking in a cool $420 million. They did this (from what I can tell) when oil was trading at about $77 – about $20/bbl too early. They left $500 million on the table. Maybe more. And now they're fully exposed to $55 oil. Factoid: $420 million will fund one month of 3Q capex at CLR. One-Well Shale's “honest income statement” shows that 2014 shale technology is economical at $100 oil, assuming “average well production” - an IP of 500 is average in the Bakken. Of course, shale companies must survive today, with oil at $55/bbl. Let's assume OAS gets serious, and drills only in their really hot areas. Viewed through the One Well Shale P&L statement, if I set the IP=750, and I set the oil price to $87/bbl, cash flow is $9M in the first year and a 3-year ROI of 67%. Through 1H 2015, OAS will be all right if they can just drill their best opportunities, and rely on their hedge book to keep them afloat. That's not the the same thing as asking if the wells they drill will be “profitable long term” since that $87/bbl price obtained via hedges will only last through 1H 2015. Once the hedges run out, those IP=750 wells will be just barely above break-even (after 3 years!) at $55/bbl. But for the moment, OAS can stay above water. I'm deliberately avoiding the question of how long-lived the shale resource is. I am just answering the question: what is the break-even oil price for drilling a Bakken shale well. The answer is, with an average well (IP=500) at a company with an average cost structure is long-term break-even at about $99/bbl, best case, assuming 3 wells per square mile and a property cost of $10k/acre. Bottom line: the average US shale oil well is uneconomical even with hedging in place, since most hedging is around $90/bbl and the break-even is $99/bbl. In Part 2: The Destruction That Awaits, we delve into the important question of the longevity of shale oil supply. The projections we can make from the latest data are quite frightening. As is the massive impact today's oil prices will have on the shale industry should they persist. Simply put, if oil prices stay at $55/bbl, we will eventually lose the vast bulk of US shale oil production, simply because perhaps 3/4 of even Bakken shale is just not economical at that price. And this prediction assumes the economy continues along as it has for the past several years. Should there be a serious economic contraction and/or a tightening of the credit markets, and the declines hit harder, many fewer shale drillers will be able to find any sort of funding, property sales will be fewer and for lower prices, and a lot more shale drillers will go bankrupt – and recoveries on those bankruptcies will be lower. Knock-on effects will hose the banks providing credit lines, vendors that provided services to companies and were not paid, and pension (and bond) funds that bought the junk bonds that are now worth pennies on the dollar. All of this will simply worsen the carnage to the shale sector. Christmas may be not so merry as we hope. Economists have argued that gift giving is an inefficient way to allocate resources, and it is widely suggested that Christmas brings a peak in prices and the number of suicides, or even disrupts the business cycle. This column discusses some conventional wisdom about Christmas and shows that economic research in fact runs counter to some of these common beliefs. The idea that Christmas might incur a welfare loss has been well known to economists since Joel Waldfogel published his research on the deadweight loss associated with the holiday season (Waldfogel 1993). In addition, several articles discuss topics like Christmas pricing, weight gain at Christmas, and the optimal height of Christmas trees. In a recent paper (Birg and Goeddeke 2014), we present findings that contradict some common beliefs about Christmas held by economists (and maybe non-economists too). Do You Believe That Prices Peak During Christmas Time? Basic economic theory suggests that before Christmas, demand for Christmas-specific goods such as certain foods or consumer goods increases, causing the demand curve to shift outwards. As long as this is not accompanied by an increase in supply, we should expect to see higher equilibrium prices at Christmas. But empirical research shows the opposite – Warner and Barsky (1995) find falling prices for consumer goods such as action figures, power tools, and food processors. This is in line with the research of Chevalier et al. (2003) and MacDonald (2000) who show reduced prices for groceries. Different reasons for this (maybe at first sight) surprising result have been discussed. Warner and Barsky (1995) argue that due to higher economies of scale in price search during periods of high demand it pays-off for consumers to search more for lower prices before Christmas. The demand elasticity for each retailer is thus higher and this reduces prices. Another reason for lower prices might be a higher incentive for firms to deviate from tacit collusion during periods of high demand (Rotemberg and Saloner 1986). Nevo and Hatzitaskos (2006) estimate brand level demand for groceries, finding more price sensitive demand and changed brand preferences during periods of high demand. Consumers switch to cheaper brands and this reduces average prices. In one market where one would not have expected it, a price increase before Christmas has been clearly established. In countries celebrating Christmas, stock prices increase in the days before Christmas.3 This particular price increase might be a surprise, at least for economists believing in Fama’s (1970) ‘Efficient Market Hypothesis’, according to which abnormal returns on predetermined occasions such as Christmas cannot exist, as the knowledge of that this effect exists should be sufficient for all rational investors to exploit this effect, so that it eventually disappears. But Chong et al. (2005) show that the Christmas effect declined in the US stock market over the last three decades of the twentieth century. In the long run, this pre-Christmas stock market effect might disappear. Do You Believe That the Number of Suicides Peaks Before Christmas? Another common belief is that holiday joy and cheer amplify loneliness and hopelessness and therefore increase suicide rates. Another reason discussed is that high expectations during the holiday season could only be disappointed and thereby cause suicides.4 In a literature review, Carley (2004) shows that empirical research points again in the opposite direction – fewer people commit suicide at Christmas. However, the number of people committing suicide increases subsequently at New Year. Nevertheless, there seem to be other reasons why Christmas can be life threatening to all of us. The homicide rate increases in the US.5 In addition, a hospital emergency department visit might be especially dangerous at Christmas time. As Phillips et al. (2010) show for the US, the number of people dying in hospital increases at Christmas and New Year. Similar findings have been established for the UK by Keatinge and Donaldson (2005), although Milne (2005) cannot find such an increase in death rates. The reasons for this increase in death, according to Phillips, do not seem to be the excitement for Christmas but rather overcrowded emergency departments. Do you Think That the Monetary Value of Presents You are Giving to Your Beloved is of Importance? In his seminal paper, Waldfogel (1993) discusses whether Christmas entails a welfare loss due to Christmas presents that the receivers do not value as high as givers thought. A lively debate arose amongst economists about the right ways to measure this possible welfare loss, resulting in some researchers showing a welfare gain and others confirming Waldfogel’s welfare loss.6 Even if the discussion on the welfare effect of Christmas is ongoing, some institutional settings should be discussed to solve (potential) welfare loss – Flynn and Adams (2009) show that givers systematically overestimate the importance of the present’s monetary value to the gift-recipient. One solution to this possible welfare problem might therefore be to opt for more humble Christmas presents. Giving cash would be another economically efficient, but socially inappropriate solution. Therefore gift cards may represent an intermediate between in-kind presents and cash (Offenberg 2007, Principe and Eisenhauer 2009). Offenberg (2007) also finds a welfare loss of 10% for gift cards, as measured by the difference between the face-value of a gift card and the willingness-to-accept –that is the resell price on eBay. So, as long as gift cards also do not seem to be the right solution, humble presents or a wish-list might be an economically reasonable way to reduce a potential welfare loss. Do You Believe That at Christmas Time the Economy Peaks? Several macroeconomists have tested for a so called ‘Santa Claus Effect’ in business cycles, that is, a boom in the fourth quarter and a following trough in the first quarter. Overall the results are mixed, with some papers finding this effect, while others could not – or only in some countries – establish a ‘Santa Claus Effect’.8 More interesting than the question of whether Santa establishes a business cycle is whether such an increase in output and employment in the fourth quarter followed by a contraction the following first quarter is economically efficient.9 Reliable research results on the effects of Christmas on growth are very limited. Maybe the government should smooth the business cycle and decrease spending in the fourth quarter, while increasing spending in the remaining three quarters. In this way, there could be a bit of Christmas every day. Last week we learned that the key to a strong economy is not increased production, lower unemployment, or a sound monetary unit. Rather, economic prosperity depends on the type of language used by the central bank in its monetary policy statements. All it took was one word in the Federal Reserve Bank's press release – that the Fed would be "patient" in raising interest rates to normal levels – and stock markets went wild. 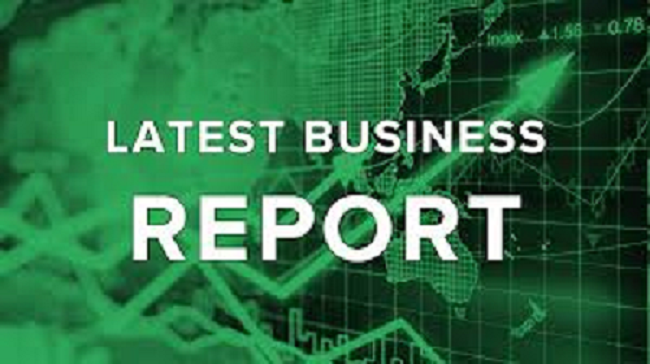 The S&P 500 and the Dow Jones Industrial Average had their best gains in years, with the Dow gaining nearly 800 points from Wednesday to Friday and the S&P gaining almost 100 points to close within a few points of its all-time high. Just think of how many trillions of dollars of financial activity occurred solely because of that one new phrase in the Fed's statement. That so much in our economy hangs on one word uttered by one institution demonstrates not only that far too much power is given to the Federal Reserve, but also how unbalanced the American economy really is. While much of the media paid attention to how long interest rates would remain at zero, what they largely ignored is that the Fed is, "maintaining its existing policy of reinvesting principal payments from its holdings of agency debt and agency mortgage-backed securities in agency mortgage-backed securities." Look at the Fed's balance sheet and you'll see that it has purchased $25 billion in mortgage-backed securities since the end of QE3. Annualized, that is $200 billion a year. That may not be as large as QE2 or QE3, but quantitative easing, or as the Fed likes to say "accommodative monetary policy" is far from over. Since 2001, the United States has grown by 38 million people and the working-age population has grown by 23 million people. Yet the economy has only added eight million jobs. Millions of Americans are still unemployed or underemployed, living from paycheck to paycheck, and having to rely on food stamps and other government aid. The Fed's easy money has produced great profits for Wall Street, but it has not helped – and cannot help – Main Street. Will the Oil Collapse Kill Energy Junk Bonds?